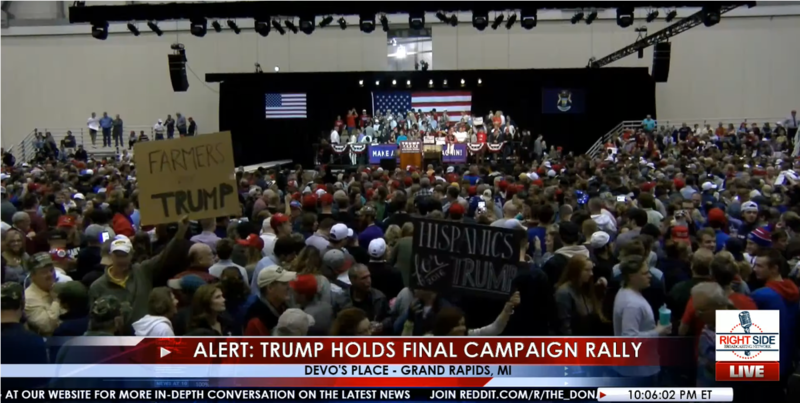 On year ago we published the following post after candidate Donald Trump’s last campaign stop in Grand Rapids, Michigan. It was the early hours of November 8th – election day – and was the future President’s 5th event that day after months of campaigning. Just imagine what our country could accomplish if we started working together as one people, under one God, saluting one American flag. I’m asking you to dream big because with your vote we are just hours away from the change you’ve been waiting for your entire life. So to every parent who dreams for their child and to every child who dreams for their future I say these words to you tonight. I am with you. I will fight for you and I will win for you. I promise. To all Americans tonight in all of our cities and in all of our towns, I pledge to you one more time. Together we will make American wealthy again. We will make America strong again. We will make America safe again and we will make America great again! His next speech will be his victory speech Tuesday night. Thank you. Sorry to keep you waiting complicated business! America was waiting for President Trump for decades and her prayers were answered on election day exactly one year ago.